Over the summer, the six vans, costing more than $10 million in total, will replace the NZRB’s eight existing analogue vans, which have reached the end of their economic life. Head of broadcasting Glen Broomhall says switching to digital broadcasting will allow the NZRB, which films 950 races a year for the Trackside channel, to broadcast in both the traditional 4x3 format as well as the widescreen 16x9 commonly used by other television networks. However, the NZRB faces having to spend up to an extra $1 million more to “retrofit” its new $2.2 million cameras, if outside broadcasting has to migrate from the “O” band to the “OX” band, as currently proposed by the Ministry of Economic Development. Rather than have a changeover in 2010, the NZRB has told the MED it would prefer “sunset” for the “O” band to be in 2012, to make its new cameras more commercially viable. The filming of races uses a mix of cabled and wireless cameras operating off the “O” band, Broomhill explains. The wireless cameras operate from remote regions on the racetrack — camera towers up to 800m away from the OBV and also the race-start positions. There can be up to the maximum of four NZRB wireless cameras operating on a single race day. The new vans, due for roll-out from next week, during Christchurch Cup Week, will be fitted with Thomson LDK 400 digital cameras. They will be deployed using a mix of cabled and wireless interconnectivity. Across the country, the OBV fleet will be equipped with 20 wireless cameras operating on the “O” band. The NZRB says it has been aware of MED plans to auction-off this band for future broadband use, and that the ministry plans to migrate present users to secure spectrum on the “OX” band. However, Broomhill says there are currently no commercial suppliers of digital camera equipment using the “OX” frequency, so the board has been forced to buy cameras that use the “O” band. Camera supplier to the NZRB, Thomson Grass Valley, has told the racing board it would take 18 months or more to develop a retro-fit so “O” band cameras could operate in the “OX” band. This would cost $15,000 to $18,000 per camera chain. “If we are forced to move onto the “OX” band, it would require significant change. 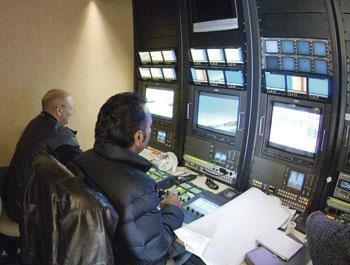 We are building six new digital trucks so they can have 14 cameras each,” Broomhill says. “We rely on the ‘O’ Band, as most broadcasters do. It’s a cost issue and timing implication,” he explains. The new digital vans will operate using the SDI serial digital signal. “We considered going to HDTV but decided we would re-look at that in five years. They key factor was cost — you don’t add 30% for this. For us to get the signal out to the track over 900 times a year is very expensive. The bandwidth required to get the signal from the racetrack to the studio would be substantially higher (under HDTV),” he adds.